How Scottish Gaelic revivalist and nationalist Ruaraidh Erskine was radicalised by Padraig Pearse and Irish nationalism. By Patrick Witt. 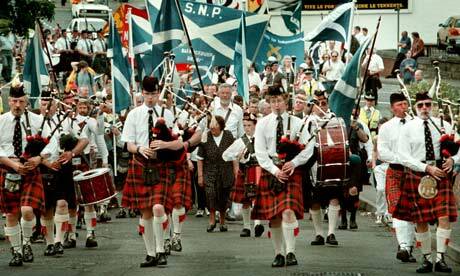 Scottish Nationalists march. Their predecessors in the early 20th century took some inspiration from Irish cultural nationalism. Nearly a century after the 1801 Act of Union was dissolved, the complex factors that stymied Irish integration in the British system has been the subject of numerous academic studies. The older union between England and Scotland has been far more resilient. The 1707 union’s survival has been rooted in economic development, geographical convenience, and religious and cultural compatibility. Yet, Scottish nationality never fully yielded to a monolithic British identity. This essay aims to shed light on a thread of Scottish nationalism that found inspiration in the Irish Gaelic revival and, later, in the Irish Revolution. The primary subject of this study, Ruaraidh Erskine, did not convert a significant amount of Scots to his irregular orthodoxy. He did, however, form an impressive network of Scottish nationalists. Erskine represents a nexus between Irish separatists and Scottish politicians, labor leaders, and intellectuals. The purpose of this essay is to illuminate an underappreciated connection between Irish separatist thinking and Scottish political thought in the early twentieth century. At this time, the dominant strand of Irish nationalism also emphasized a moderate form of Irish Home Rule. Even Patrick Pearse, soon to be the spokesman of radical Irish nationalism, did not yet advocate violent revolution.The extent of Erskine’s ambitions reflected the mood of Irish Gaelic revivalists. It stands to reason that if most Irish Gaelic revivalists didn’t yet directly employ their language as a justifying principle for Irish political independence, the much smaller Scottish Gaelic movement, in a province more tightly bound to the British multi-national project, also could not do so. Of course, in time conditions changed. Pearse and Erskine probably met at the pan-Celtic Congress in Cardiff in 1899, at which both men were in attendance and that Arthur Griffith began his association with Erskine. Seven years later, Pearse’s direct connection to Erskine is rooted in their shared interest in education as an essential anti-Anglicization tool. In 1906, as he began to shift his energies from his Gaelic League responsibilities and focus squarely on schooling, Pearse contributed an article to Guth Na Bliadhna. In “Education in the West of Ireland,” Pearse stressed the destructive nature of Anglicization. Despite this, Pearse identified the achievements of Gaelic education in western Ireland. He noted the particular joy he found in overhearing young boys utilizing the Irish language in everyday conversation. Perhaps most importantly, he urged Scots to heed lessons from the Irish Gaeltacht. He believed that Scotland, too, had a glorious Gaelic community but lamented its demise at the hands of the English. Erskine maintained similar beliefs about Gaelic education and radicalized along a similar timeline. Erskine’s educational demands also mirrored Irish nationalist rhetoric through his emphasis on university education. He wrote, “The old zeal for learning… has declined with the decay of our patriotism… the present condition of Aberdeen is that of a sixth rate grammar school. Judged by the standards of our national ideal, St. Andrews is in just as perilous a condition. Of course no provision for Gaelic studies is yet in force at either of them.” Given that Guth na Bliadhna was published by the University of Aberdeen Press, his rebuke was particularly bold. A highland riot. Gaelic speaking Scottish farmers faced some of the same land struggles as did their counterparts in the west of Ireland. The centrality of education was not Erskine’s only emulation of Irish nationalist rhetoric. Just as supporting the Gaels of Connacht played a pivotal role in Pádraig Pearse’s rhetoric, Erskine defended the cause of the Highland Scottish peasants. In an article titled, “Recent Crisis in the Gaelic Movement” he directly connected the troubles of Scottish Gaelic peasants to the struggle of the language. Erskine argued that Scottish Gaelic enthusiasts were too academic in their interests. Aware that most members of Gaelic societies were bourgeois socialites, Erskine implored his readership to actively support the cause of the indigenous Scottish Gael. He wrote, “Now, the Land Question is a question which the Gaelic Movement in Scotland and its organized forces must face… Unless the people are settled on the land of their fathers… the Gaelic language will die.”By emphasizing the natural rights of Gaelic Scots to the land, and the centrality of the peasant population to the maintenance of Scottish Gaeldom, Erskine hints at his convictions about the essential place of the native people to the Scottish Highlands. Erskine thought that true Scottishness was personified by those living in the glens of the Highlands, not by the factory owners of Glasgow. One of the notable contributors to his second literary endeavour was a well-respected professor of Scottish history from the University of Glasgow, Robert S Rait. The latter’s 1914 article, “Traces of the Celt in the Lowlands,” suggested that the Gaelic language was once spoken extensively throughout the Lowlands. Rait had discovered various quotations from seventeenth century nobles attesting to the existence of a thriving Gaelic culture in the lower part of Scotland, and, no doubt encouraged by Erskine, he hoped to author a study about the erosion of the Gaelic language. In Erskine’s efforts to construct a new Gaelic Scottish history, the imperialistic role of the English was paramount. As he sought to revitalize the language, he had at least found another intellectual whose interest was piqued by Scotland’s Gaelic past. This passage allows one to assess Erskine’s perceptions of and ambitions for the Gaelic revival. Having slightly altered the tone of his discourse, Erskine gently prodded Lowland Scots to embrace the historic role of Gaelicism. Just as Pearse felt that a re-Gaelicized Ireland was a necessary, Erskine thought that a Gaelicized Scotland was needed before the Scottish population could comprehend their historic subjugation and demand independence. Erskine argued there was no ethnic justification for the maintenance of a united Great Britain. He argued that the defenders of union based their justification of Britain not on a shared racial or historical background, but rather on the legality of the Act of Union in 1707. Yet, he argued, the Scottish nobles who had shaped the Act intentionally negotiated in secret, so as to hide it from the populace. If the issue of union had been disseminated to the public, it would have been akin to “procuring its death sentence.” He argued that, without the consent of the people, the union was never truly valid. Here again, Erskine’s rhetoric emphasized the centrality of education to his mission. Acknowledging a lack of widespread separatism, he vowed to tutor Scots on the disagreeable nature of union. His carefully formed argument, asserting the fallacy of any notion of a shared Britannic nationality, and his declaration that Scottish negotiators had betrayed the interests of the Scottish people, borrowed from the rationale articulated by Arthur Griffith. After the Easter Rising took place, Erskine waited several months to publish his reaction, probably due to fear of censorship. He noted the obvious. Militarily, the Rising was bound to fail. He blamed the destructive nature of English colonial hegemony for creating an environment that fostered bloody rebellion. Moreover, he took the opportunity to openly promote the politics of Arthur Griffith and Sinn Féin. He praised Griffith’s theory that Ireland “must be taught to depend on its own exertions in order to work out its political, social, and economic salvation.” Erskine went on to applaud Griffith’s ideas of boycotting the British state. He drew parallels between Ireland and Scotland and concluded: “the Celtic people have a civilization of their own. They wish to revive it.” Thus, Erskine virtually claimed Pearse’s “blood sacrifice” and the Easter Rising as a turning point in his Scottish independence movement. The radicalization of Erskine’s discourse continued through the aftermath of the Rising. The Scottish Review stated: “Caesar is dead or dying- let democracy flourish and live forever!” Clearly, Erskine felt that the enflamed situation in Ireland marked a turning point in the battle against the Anglicization of the Gaelic world. In making his case for Scottish independence, he continually used his interpretation of the Act of Union as a justification for an autonomous Scotland. Employing heavily loaded language, he wrote, “[The Act of Union] was a scandalous and unparalleled usurpation. A gross and barbarous invasion on the part of one country of the just national rights and liberties of another… we now expose it, or serve to upset the judgement that it is null and void.” Thus Erskine’s dramatic reconstruction of Scottish history took on an increasingly violent use of language. One would not have to take much of a leap of faith to ascertain that matters in Ireland heavily influenced his composition. 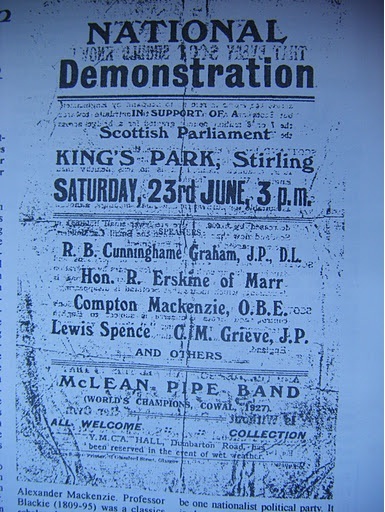 A ‘National Demonstration’ in Stirling, featuring Ruairidh Erskine. Having already aligned himself with the ideology of Sinn Féin, and probably aware of their success in the 1917 by-elections, Erskine’s label of their tactics as “the Irish movement” was bold and, perhaps, prophetic. Sinn Féin’s eventual near sweep of the nationalist vote in the December 1918 general election represented a major turning point in Irish history. In the year of the general election, Erskine’s optimism again was on display. 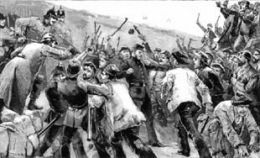 In a manner evocative of Irish revolutionary celebration of the Fenian struggle against British hegemony; Erskine emphasized recurring historic Scottish rebellions as further proof of a Scottish separatist tradition. Drawing readers’ attention to the Scottish Jacobite risings, he wrote, “Though the risings of the years 1715, 1719, and 1745 were ostensibly dynastic undertakings… their main springs centred in the popular discontents engendered by the Union Treaty.” By de-emphasizing the Jacobitism of the risings, and refocusing his readers’ attention upon repeated historical contention with the union, Erskine again displayed his attempt to re-imagine the crucial storylines of Scottish history. Erskine became increasingly radicalised after 1916. In 1920 he tried to procure Irish support for a Scottish rising. After being told about the embryonic plan, Michael Collins turned down the idea, suggesting that Erskine and his ilk were unaware of the challenges involved in and advising them to rethink their plans. He indicates that Scots “eagerly received” French revolutionary principles before revolutionaries were betrayed to the government. Interestingly, he wrote that Scots had also agitated for independence in 1848. In neither situation did Erskine provide details of the Irish involvement, which might have constituted a missed opportunity to mark direct Irish and Scottish revolutionary cooperation. Erskine’s provocative language may have dissuaded previous contributors from publishing essays in the Scottish Review.One such example was James Hogge, Liberal MP. A vocal leader in the pursuit of Scottish Home Rule, Hogge’s essays on Scottish economics had been a staple of Erskine’s journal Edward T. John, a Welsh Home Rule MP, James Maxton, the future leader of the Independent Labor Party and historian Robert S Rait also withheld any further contributions. Erskine continued to cooperate with Scottish nationalists, including several of the above-mentioned leaders, but their involvement with his publication had ceased. Erskine was increasingly reliant upon himself to write many of the articles. The piece that probably spooked his contributors, and perhaps much of his readership, was titled “Who fears to Speak of Easter Week?” Erskine did not. Others apparently did. During the aftermath of the Great War, Erskine hoped to secure a spot for Scottish inclusion at the Paris Peace Conference. In pursuit of tangible political pressure, he formed a National Committee. The Committee originally consisted of eight members, including two members of Parliament, one of whom was J. M. Hogge. The Committee sent a formal request for independent Scottish representation to French President Poincairé.Erskine reported that Poincairé acknowledged receipt of the document, but no action was taken to accommodate the nationalist Scots. The make-up of Erskine’s National Committee can be seen as the culmination of his efforts to merge lowlands labour interests with Gaelic Highland agitation. A study of its dynamicsallows one to note Erskine’s trend of mirroring the Irish separatist example. The Easter Rising was not solely the effort of Erskine’s associate, cultural nationalist Patrick Pearse. An essential component of the Rising’s leadership coalition was James Connolly, the Scottish-born Belfast labour leader. Erskine’s coalition with MacLean represents two components of Erskine’s vision. He recognized the obvious; any revolutionary Scottish movement needed labour involvement. He also continued to be instructed in insurrection by the Irish example. In the spring of 1920, the Scottish Review published its final addition. Guth na Bliadhna continued into the 1920s. Although he lost his most prominent mouthpiece, Erskine continued to promote Scottish and Irish freedom, through the National Committee and otherwise. Privately he went so far as to approach Art O’Brien, an Irish republican agent in Great Britain, about procuring Irish support for a Scottish rising. He imagined playing Pearse’s role in a Scottish context. After being told about the embryonic plan, Michael Collins turned down the idea. Unlike Pearse, Collins wasn’t willing to engage with militant Scottish nationalists.He suggested that Erskine and his ilk were unaware of the challenges involved in such an undertaking and they were advised to rethink their plans. Having found himself unable to replicate the Easter Rising, Erskine,with other members from the National Committee, helped to found the Scottish National League in 1921. The League, of which Erskine was president, was the direct predecessor of the National Party of Scotland, which in turn helped to form the Scottish National Party that controls the parliament in Edinburgh today. The parties that sprang from his League did not adopt Erskine’s prescribed methods of attaining Scottish autonomy. According to Richard Finlay, by 1926, Erskine’s role in the League amounted to little more than being a “colourful figurehead.” Still his role in promoting Scottish nationalism is undeniable. An analysis of Erskine’s discourse clearly indicates the degree to which he looked toPatrick Pearse, Arthur Griffith, and Ireland for inspiration and direction in articulating the justification for Scottish independence. Irish separatist rhetoric formed an essential model that Erskine borrowed heavily from. The current situation in Scotland may not lead to a fully autonomous Scotland, but it certainly warrants a closer look at the formative years of contemporary romantic Scottish nationalism. In that regard, Erskine’s role deserves closer attention from the academic community. 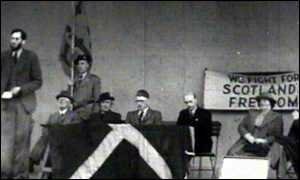 Erskine remained a fringe figure but in 1932, Scottish nationalists (pictured here), formed the Scottish Party, the ancestors of today’s SNP. While Erskine’s hoped-for revolution did not take place during his lifetime, he helped to keep the faintly lit embers of Scottish nationalism alive. As H.J. Hanham noted, “the Scottish Review and Guth na Bliadhna are two of the few major landmarks of early twentieth-century nationalism, along with the poems of Hugh MacDiarmid.”Perhaps James Hunter was premature in his 1975 assessment that, “the Gaelic connection appears to have been decisively severed.” The Scottish National Party will have their referendum and the place of Gaelicism in Scottish culture seems cemented. At the very least experts expect that devolution will extend to new levels of domestic control. The Purpose of this study has not been to reinterpret the origins of the current Scottish nationalist challenge. Rather, it has been to illuminate a network of agitation and resistance to English political, cultural, social, and economichegemony that traversed the North Channel, and centred on Ruaraidh Erskine’s engagement with and emulation of Irish Gaelic cultural revival and nationalism. This seemingly obscure Scottish nationalist undoubtedly maintained extreme political viewpoints that did not resonate with the general public, but the numbers of important men willing to engage with Erskine and publish in his journals necessitates a closer look at this outlier’s influence on a nationalist ideology that now hopes to establish a Scottish nation-state. Guth na Bliadhna Vol III. 1906, 12. Elaine Sisson, Pearse’s Patriots: St. Enda’s and the Cult of Boyhood. (Cork: Cork University Press, 2004), 22; Pearse’s educational philosophy is also outlined well in: JoostAugusteijn,Patrick Pearse: The Making of a Revolutionary. New York: Palgrave Macmillan, 2010. Patrick Maume, The Long Gestation (New York: St. Martin’s Press, 1999), 50. Guth na Bliadhna Vol. II.1906,p.376. Guth na Bliadhna Vol. VII 1907, 170-171. Guth Na Bliadhna Vol. V. 1908, 244. Who’s Who 1914 (London: Adam & Charles Black, 1914),1724. Scottish Review (Summer: 1914): 306. Scottish Review (Summer: 1915): 270-272. Scottish Review (Spring: 1916): 17-18. Scottish Review (Autumn: 1916): 360. Scottish Review (Autumn: 1916): 374. Scottish Review (Autumn: 1917): 315. Scottish Review (Winter: 1917): 420. Scottish Review (Winter: 1917): 424-425. Elaine McFarland, Ireland and Scotland in the Age of Revolution. (Edinburgh: University of Edinburgh Press, 1994). Scottish Review (Winter: 1918): 428. Edward T. John, MP published an article, “Enter the Celt,” about Welsh aspirations for Home Rule in Scottish Review (Autumn: 1916): 299-315. Scottish Review (Autumn: 1919): 347. Original National Committee membership: J.R. Duncan; J.M. Hogge, M.P. ; Aonghas Mac Earruig; Angus MacDonald; F.J. Robertson; William Pringle, M.P. ; Robert Smillie; and Erskine. Scottish Review (Winter: 1919): 447. New National Committee membership, in addition to Erskine, was as follows: Duncan MacGregor Graham, M.P. ; William Graham, M.P. ; J.M. Hogge, M.P. ; Thomas Johnston, editor of Forward; David Kirkwood, Glasgow Trade Councilor and future MP; Angus MacDonald, President of the Highland Land League; Aonghas Mac Eanruig, editor of Alba; John MacLean, socialist leader with Bolshevik connections; Neil MacLean, M.P. ; James Maxton, future MP and future leader of the Independent Labour Party; John Robertson, M.P. ; Robert Smillie, President of Miners’ Federation. ; Alexander Wilkie, M.P. Scottish Review (Winter: 1919): 448. Erskine’s overture to Collins is referenced in Máirtín Ó Catháin, “Michael Collins and Scotland” in Ireland and Scotland in the Nineteenth Century. (Dublin: Four Courts Press, 2009), 170; The challenges involved in Irish and Scottish political cooperation is discussed in: Máirtín Ó Catháin, Irish Republicanism in Scotland, 1858-1916. Dublin: Irish Academic Press, 2007; Andrew Newby, Ireland, Radicalism, and the Scottish Highlands, 1870-1912. (Edinburgh: Edinburgh University Press, 2007). Richard J. Finlay, Independent and Free: Scottish Politics and the Origins of the Scottish National Party, 1918-1945. (Edinburgh: John Donald Press, 1994), 65. H.J Hanham, Scottish Nationalism (Cambridge, MA: Harvard University Press, 1969), 135. James Hunter, “The Gaelic Connection,” Scottish Historical Review 54:158 (1975), 203. Charles King, “The Scottish Play: Edinburgh’s Quest for Independence and the Future of Separatism,” Foreign Affairs 91:5 (Sept/Oct., 2012): 113-124. Patrick Witt is a second year PhD student at the University of Missouri, studying under Kerby Miller. He is exploring the intersections with the Irish and Scottish Gaelic revival movements and politics. 3 Responses to "Connections across the North Channel: Ruaraidh Erskine and Irish Influence in Scottish Discontent, 1906-1920"
Enjoyed reading this very much — as an undergrad I wrote a couple of essays touching on “REoM” (as he is in my notes). I remember Jim Hunter’s 1970s article “The Gaelic Connection” being influential. I was reading through a few years’ copies of the newspaper Sinn Féin last week (ca. 1906-1910) and came across REoM’s writings again, so thought I’d see if anyone was working on him – great to see this! Good luck with the rest of the thesis.